I frequently pass the massive Sto. Domingo Church in Quezon City when I was still an Architecture student en route to the University of Santo Tomas. I was very much into modern architecture back then and I was always intrigued by the old church with the austere modernist façade. My curiosity finally took the better of me when I recently plied Quezon Avenue and once again passed by the Dominican church. More than a decade after my college years, I at last asked the jeepney I was riding to stop. It was just pure luck that I have a camera on hand that day. 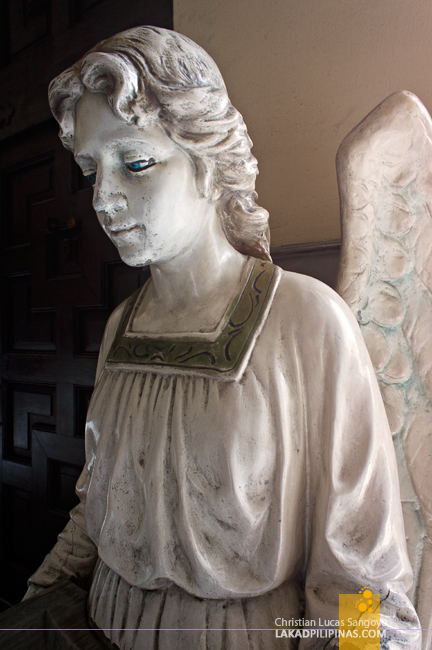 A marble angel holding a basin of holy water greeted me as I entered its door. The current Sto. 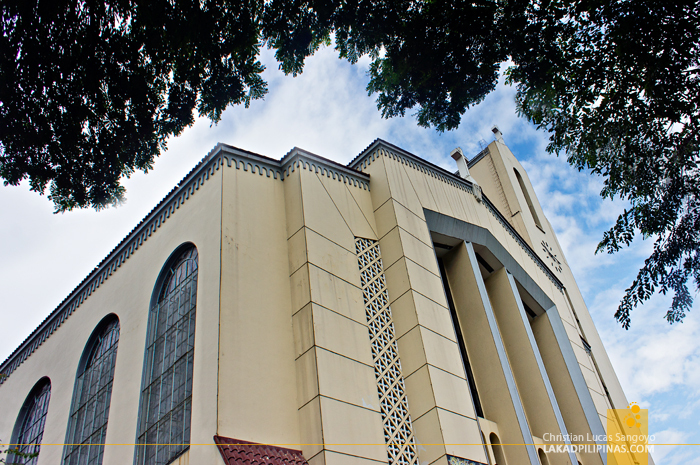 Domingo structure is the sixth incarnation of the church since its humble nipa beginnings in 1588. 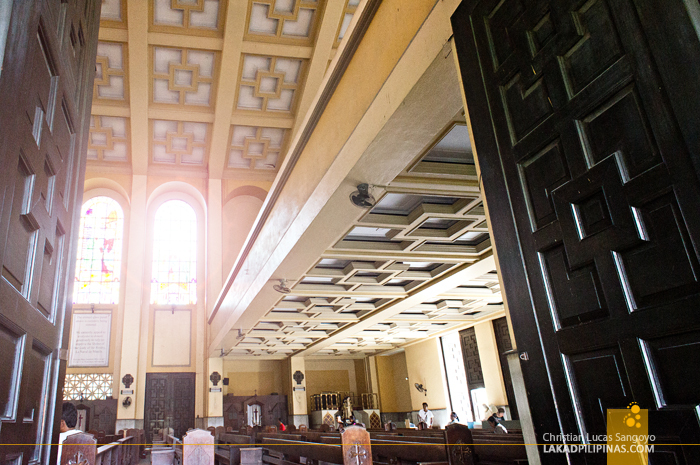 It first stood as one of the majestic eight churches inside Intramuros before it was bombed to oblivion during the Second World War. 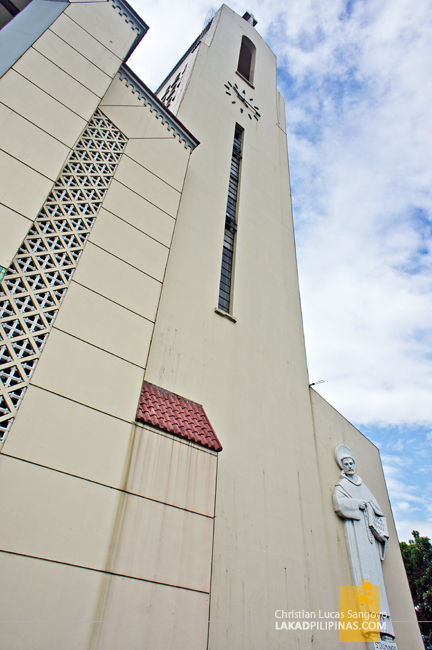 Transferring to the plains of Quezon City after the war, the new church done by a host of noted artists was inaugurated in 1954. The job of designing the new structure fell on the hands of Jose Ma. 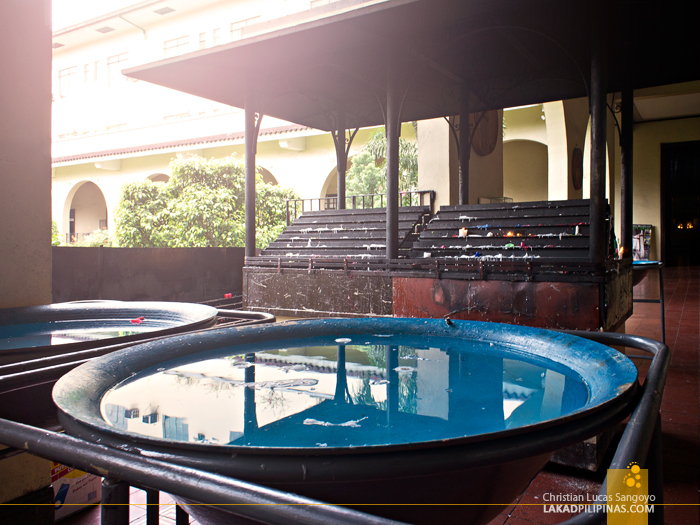 Zaragoza, A UST Architecture student who’s later claim to fame were the religious structures around the country. 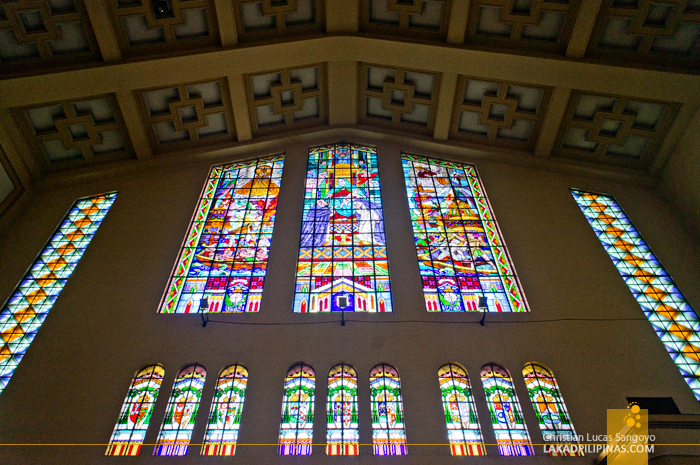 Beautiful translucent stained glass windows line the lofty interiors of the church; the fifteen mysteries of the rosary, depictions of the lives of famous Dominican saints and the La Naval Battle. Everything was done by Galo B. Ocampo, a renowned modernist painter from Pampanga. Angono’s pride, the late National Artist Carlos “Botong” Francisco has also had a hand in decorating the Sto. Domingo Church. Eight murals measuring three meters wide and nine meters long circle the church’s cupola depicting saintly Dominican ways. Outside, carvings done by Italian sculptor and then UST professor, Francesco Monti, abound. 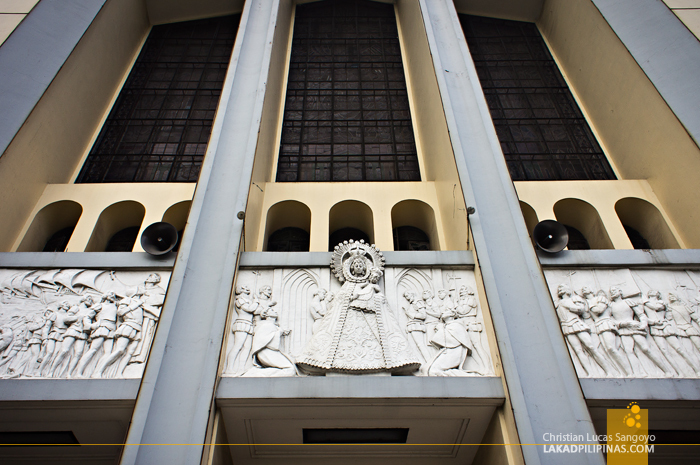 A larger than life relief of St. Dominic stands at the foot of the structure’s 44-meter belfry while a detailed depiction of the Battle of La Naval hovers over the church entrance. But besides the rich religious art, what really draw people to Sto. Domingo Church is the Nuestra Senora de La Naval. 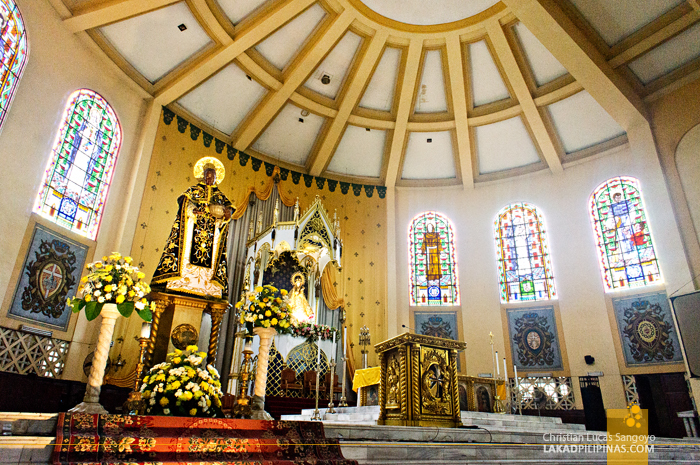 The three centuries old icon dressed in golden garb holds the central altar of the church. 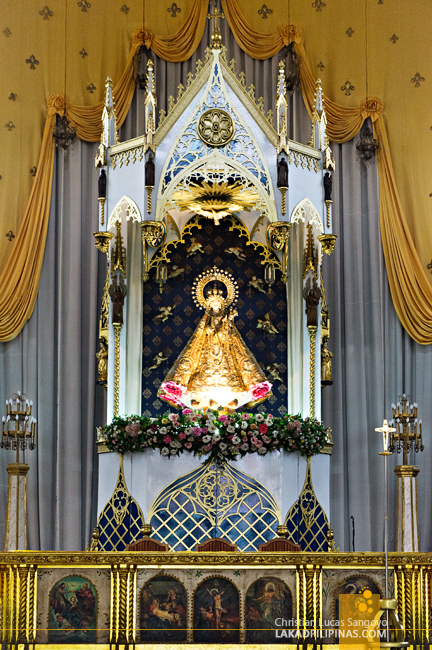 Rescued from the original church in Intramuros during the war, it was transferred to its new home in Quezon City through a solemn procession in 1954. The image was made way before the Spanish-Filipino victory over the Dutch navy in 1646, which it is now commemorated on. Carved out of ivory and hardwood, it was ironically sculpted by Chinese non-believers, who in turn was said to convert into the Christian faith afterwards. Sto. 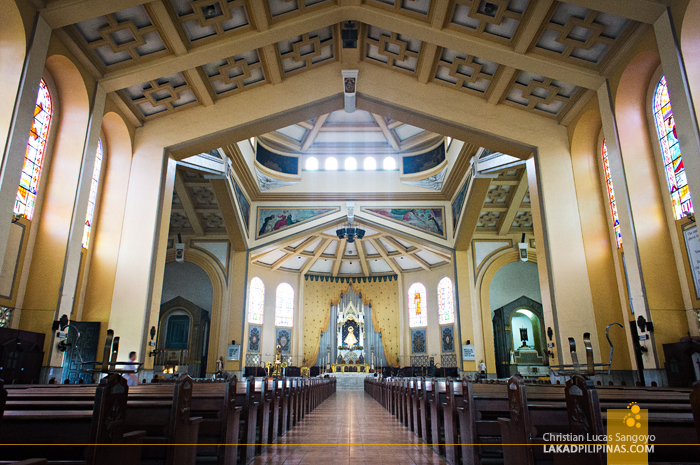 Domingo Church is one of the largest churches not only in the country but in the whole of Asia. Its whole structure, both inside and out is a treasure for the arts. It’s history dating back to the Spanish era. It’s festival, one of the oldest in the metro. And I’m asking myself why only now; I admonish myself for not entering its premises sooner. nice! miss ko na tong simbahang to!! !